Soak prunes overnight in the cold tea, drain and then just cover them with water, add the sugar and simmer for 15 minutes. Drain, sprinkle over the brandy, cover and refrigerate until ready to use. Whilst your roast goose is standing, heat the prunes gently in a frying pan and then stand in a warmed dish to serve along with the stuffings. Lightly fry the chopped goose liver in butter. Mix all ingredients together in a bowl, season well and bind to a loose stuffing with beaten egg. Spoon the mixture into the goose cavity. Soak the prunes for one hour in the port. Meanwhile prepare the chestnuts. Make a slit in the top of each one with a sharp knife. Put them in boiling water and simmer for ten minutes. Remove a few at a time with a slotted spoon. Wearing clean rubber gloves to protect your fingers, slip off the outer and inner skins. Place the chestnuts in a large bowl. Melt the butter in a large pan and add the onion, garlic and celery. Cook without browning until the onion has softened. Add the chestnuts and prunes with the port they have been soaking in and simmer gently for 30 minutes. Stir in the parsley, season with salt and pepper, and stuff the mixture into the goose cavity. Sew up the cavity. Put the gooseberries in a saucepan with 150ml (¼ pint) of water and cook for 4-5 minutes, until tender and pulped. Drain and rub through a sieve or purée in a blender or food processor. Add the butter, sugar, nutmeg, salt and pepper. Reheat and serve. To vary, substitute the gooseberries for either plums or apples. Soak prunes overnight in cider. Next day, place in a saucepan with 150ml (¼pt) of soaking liquor, simmer until they are plump and tender. Press through a sieve, removing the stones. Peel, core and chop apples. Soften chopped onion in a saucepan with tablespoon of goose fat. Stir in chopped apples and simmer until a soft pulp. Stir in prune mixture and sugar, taste and add more sugar if necessary. Reheat and serve. Add ¼ tsp of powdered cloves and 2 pinches of powdered mace with the sugar, if to your taste. Combine the jam and wine in a saucepan and simmer without a lid for 10 minutes. Reheat and serve. This sauce can be made well in advance. Peel, core and slice apples. Poach in saucepan with sugar, water, spices and lemon rind, until tender, stirring occasionally. Pass through a sieve or blender. Stir in unsalted butter and sherry to taste. Serve sauce hot or cold, but make sure if you are serving it cold, that it really is well chilled. To vary try adding 25g (1oz) of chopped walnuts. Put milk into saucepan with cloves, bayleaf and chopped onion. Bring to boil and remove from heat. Allow to stand for 10 minutes. Remove cloves and bayleaf. Meanwhile, break up sausagemeat and fry gently without adding any fat. Remove to a mixing bowl when golden brown and cooked through, leaving fat from sausagemeat in pan. Fry mushrooms very gently in the remaining fat, then add to bowl. Add breadcrumbs and herbs to sausagemeat and mushroom mixture. Stir in milk and onion mixture. Add egg yolk and thoroughly combine all ingredients together. Leave for at least an hour in cold place. To help keep the stuffing light and moist fold in a stiffly beaten egg white just before using. Cut bacon rashers (after de-rinding) into strips and fry these in butter until golden brown. Add chopped onion and fry until soft and transparent. Mix herbs together with suet and breadcrumbs in a basin. Add contents of pan to the basin, season well and bind with the beaten egg. Make a slit in chestnuts, cover with boiling water for 10 minutes, and remove outer and inner skins. Put skinned chestnuts in a pan with stock to cover, bring to boil and simmer until tender, about 30 minutes. Melt butter and fry turkey liver. Mix this with breadcrumbs, celery, milk and the roughly chopped chestnuts. Stir in parsley and season to taste. Place cranberries in a pan with all other ingredients. Bring to the boil slowly. Simmer uncovered until tender, about 10 minutes, bruising cranberries with a wooden spoon. Pour into a jar or container, cool, cover and store in fridge for up to a week. Reheat and serve. Cut onion in half and place in pan with nutmeg, bay leaf, peppercorns with milk. Bring up to the boil. Take off the heat, cover and leave to infuse for 1-2 hours. When ready take out the onion, bay leaf and peppercorns and put to one side. Stir in the breadcrumbs, add butter and seasoning. Leave the saucepan on a very low heat, stirring now and then, until the breadcrumbs have absorbed the milk, approx 15 minutes. 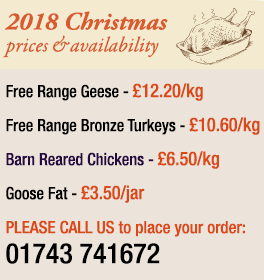 Rearing free range goose, bronze turkeys and barn reared chickens in the Shropshire countryside for the Christmas holiday celebrations.